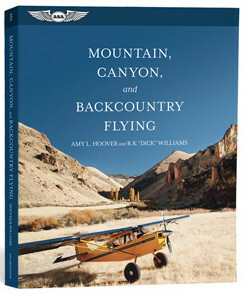 392 pages packed with information and tips on backcountry flying. Content includes preparing for and conducting mountain and canyon flights, en route and airport operations, situational awareness, aircraft performance, risk management, emergency operations, and more. Contributions and stories from guest experts enhance the technical material throughout. Each chapter includes exercises to help the reader understand and apply the information to their own flying. Full of tips gleaned from more than 150 years and 100,000 hours of collective experience. Beautiful full-color photography throughout will inspire pilots to get off the beaten path and enjoy the backcountry.